As of this writing, there were 55 customer reviews and 7 answered questions on Amazon for the WALUCAN Hiking Backpack. I've read through all of the feedback left on Amazon and then condensed the results into this report. I hope that this helps you when picking out a backpack. 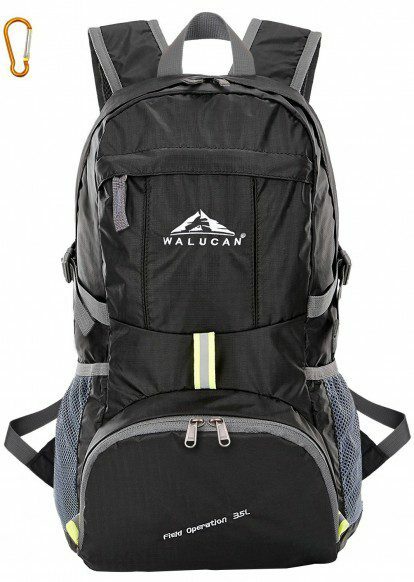 The Walucan backpack is made with high quality tear and water resistant material. It is designed to provide extra strength and long-lasting performance with the lightest weight possible. The extra strength provided by the double-layer bottom piece makes it convenient to carry more load. Heavy duty two-way metal zippers across the backpack are convenient to operate whichever side you prefer. Bar-tacks at major stress points were sewn in to help with longevity. This backpack has breathable mesh shoulder straps to help with comfort. The length of the shoulder strap is adjustable. There is also a chest strap with a whistle buckle that helps you lock your backpack in place. The WALUCAN Hiking Backpack has 1 main zippered compartment, 1 zippered inner pocket, 1 zipped front pocks, 2 side pockets and 1 unique tiny pocket for valuable items such as keys. The main compartment can store up to 35 liters of supplies. This should be enough room for a day trip or possibly overnight journey. There are also two separators that are made to help you organize your belongings. The two side pockets are big enough to hold water bottles or umbrellas. This backpack can fold into it's own pocket for storage. It's a great little backpack to take with you if you will be flying. Simply pack the folded backpack in with your regular luggage. If you will be charged an excess baggage fee, just take out the backpack and transfer some of your luggage into it. Many of the comments on this backpack were from people who took it overseas. The feedback was overwhelmingly positive. Here is one of the many happy oversea traveling customers, "Amazing versatile backpack. Recently took on trip to Paris. Put in my camera gear, batteries , my jacket etc in main compartment. Water bottle in outside side pocket . Keys in front pocket with sad cards and bag still had room. It is well built, comfortable to use with wide shoulder straps. And the best part is it folds into a tiny package. Also it looks amazing in blue." The WALUCAN Lightweight Foldable Packable Durable Travel Hiking Backpack is a great choice for elementary school children. One customer explains why here, "Excellent lightweight pack for elementary kids who want to ride their bikes to school. Form fitting and evenly balanced so it won't make them fall off their bikes. I rolled up the extra straps once they were tightened and wrapped them in a rubber band so they wouldn't get stuck in anything. The kids love the bright colors and that they fold away into the pocket. Plenty of room for folders, papers, an i pad, and a few small books but not enough space for HS biology and calculus books." A carabiner is included with your purchase of the WALUCAN Lightweight Foldable Packable Durable Travel Hiking Backpack. The carabiner lets you attach and carry keys, water bottles, small camping gear, hang lanterns and lights. The purchase of a WALUCAN Lightweight Foldable Packable Durable Travel Hiking Backpack includes a life-time warranty. You may exchange, return and the company states they will do "whatever it takes" to make it right with you, the customer. There are 9 backpack colors to choose from. They are black, blue, fuschia, green, grey, orange, red, royal blue and S. Blue. Many of the customers left feedback about how colorful these colors were. They are very popular backpack with kids and anyone who likes brilliant colors. If you are looking for an inexpensive, compact, lightweight and durable day pack backpack, you really can't go wrong with the WALUCAN Lightweight Foldable Packable Durable Travel Hiking Backpack. It has all of the qualities that I just mentioned and more. There are several compartments of multiple sizes in which to store your belongings. If you are not completely satisfied with your purchase return it for a refund. The company promises to do whatever it takes to make the customer happy. Here are some top questions that I found for people considering buying a WALUCAN Lightweight Foldable Packable Durable Travel Hiking Backpack. How comfortable and breathable on your back is it? As answered by a customer: "It is very light but durable material. The straps have a small bit of breathable padding. That being said, it's not going to be like a traditional back that have the lumbar padding/venting to make it extra breathable. It's just a basic pack that you can fold down to fit into a larger pack. It's basically going to be as comfortable as whatever you have inside of it. It's great for having an extra bag as a day pack if you're on a long hike requiring a larger pack. I use it for air travel a lot because it's so light but has lots of pockets." Can my 17 inch laptop fit in this backpack? "Yes, there is a lot of room inside this bag. I am a teacher and we carry around a first aide kit, a document case clipboard & various outdoor toys." How many colors does this backpack come in? There are 9 very colorful colors to choose from.